So then we have several generations later and I would guess the skill level is another fraction of what the generation after WCC attained. To complicate things further and as do I and other teachers of Classical Tai Chi experience, we will always see those students who are only give us a 1 - 3 year attention span and who do not apply themselves at home. If they are not staying longer one asks were they even capable of going longer than a one year maybe 3 year attention span? How much can we even pass on to them (of our own limited skills acquisition). I saw much in the way of Tai Chi "dance" performed at World Tai Chi Day for about 5 years. I saw these "dances" done by what are presumably long time practitioners, but it is not Tai Chi. One student I talk to called it "Geriatric Tai Chi", I continued with "Paint by Numbers Geriatric Tai Chi". It is obvious where the "skills" went there...never there to begin with. I have also had my own share of 1-3 week, 1-3 month and 1-3 year attention span students, how much of even the curriculum can I pass on to them, to say nothing of skill? Yet, scores of books, DVD's purport to pass on Tai Chi curriculum...but in 'easy' lessons? If it is "easy", how is it rigorous enough to gain any skill, even if we forfeit the question of limited attention span? Students leave after weeks, months and years, seemingly one might say in that "1 -3 range". I never hear from them again. I have a feeling they believe they can do it on their own. I have never believed that. I also seriously doubt that their "skill" level is increasing on their own and that they just fool themselves. In over 30 years of teaching I have only met one person named Tom Kostusiak who "came back" after studying with me for many years and stopping lessons. Tom is a very humble guy and will be the first to tell you that he even lost skills when he stayed away from lessons. 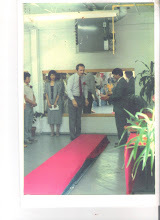 He was very grateful when I personally introduced him to Master Stephen Hwa, get the DVD set and resume study. Even with the DVD, Tom will tell you that he wishes he could attend lots more lessons but his work schedule and being out of town prevents it. The DVD series is really good, it is very rigorous but it cannot perform a critique of a student. My teacher knows this and has gone out of his way and at his own expense to make himself available all around the country. I can only hope to emulate my teacher and so I have offered to do that as well when I travel. We recently held an intensive workshop that was taught by Master Stephen Hwa and folks came from as far away as France. I also made myself available before hours and held additional intensive workshops for those that could make it. I did this in my own studio and the beautiful Japanese Gardens near Buffalo State College and the workshop. I tell students to make doubly sure they take even a seemingly "simple" correction to heart, even if it is just one correction...it will make a big difference in the long run. In light of that, I don't like to give additional corrections if I see that a student has not applied themselves to the first one. Here's an example: Classical Tai Chi requires that a foot be solidly planted before shifting weight to it, all students have problems with this one...and also tend to give short shrift to it. I see students who study for the "1 -3" who still have the problem after I give a correction...even after a year or two. In that regard, I gave a brief stepping and weighting correction to Dr. Mark Thomasson, DDS some time ago. Mark is the fellow in the video who is asking the question. I was very happy to see that he took it to heart. To top it off, his ability to learn push hands increased from buckling down to just that one correction. Note I did not give Mark "more curriculum", I gave him a correction, he took it to heart and his skill level increased. Even in light of the DVD's and such workshops, how much skill can students hope to acquire, particularly if they do not apply themselves like Mark did? Classical Tai Chi does not have a huge curriculum, you will not see such things as weapons, 30 kinds of push hands training, Tai Chi Fan, etc. I studied with other teachers before who had big curriculums but I also saw that students skill levels were not "big". An overwhelming curriculum is certainly no guarantee that students will gain more than a fraction of their teacher's skill...how could it be? I also saw that each and every student was not being taught by the Master personally, in some cases the teacher was not there to even teach the class. How can one gain skill from the teacher if the teacher is not there? Yet, I get statements from students who say they (in so many words) doubt the efficacy of DVD's as a teaching tool. Given the problems associated with getting personal attention from a high caliber teacher, what else is there available? My teacher feels that DVD's and particularly with new technology offer good opportunity for students to constantly watch and replay what he does. I agree when he says that it is like having a teacher for private lessons, much like Young experienced when Wu came to the house. In addition, he provides an incredible amount of rationale for what he teaches. I met no one before him who would deign to do that. 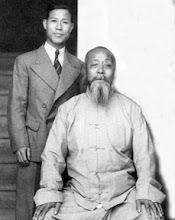 I doubt if Young Wabu asked Wu, "Could you show that to me 20 times, Master Wu?" One could not get any teacher to repeat a move 20, 30 times, could they? Even so and in addition to being able to play the DVD dozens of times, my teacher Stephen Hwa still offers practitioners the opportunity to make DVD's of their form and submit it for critique. Why don't more people do this? Perhaps it is that "attention span phenomenon" that is at play? My teacher laughs when I say: "Even with the DVD, someone still has to get up off the couch and put it in the tray". So I say to myself: Chances are we won't be up to our chins in skilled "easy" Tai Chi practitioners. One has to ask, will we be up to our chins in skilled Classical Tai Chi practitioners, which always asks that study be more rigorous? My point? The "math" works against you as it is, if you don't apply yourself and ask for critique, (even in email, Facebook, Blog, Yahoo email group, etc. ) particularly if your teacher is "out of town", think how problems associated with skill acquisition will increase...one might say it is inevitable. The Tai Chi Classics say : “If the ch’I is dispersed, then it is not stored and is easy to scatter. Let the ch’I penetrate the spine and the inhalation and exhalation be smooth and unimpeded throughout the entire body”. It is the entrance examination and a student must pass it for admission to class. It is useful for determining how serious a student is about study. It is useful for the student to determine if they are capable of doing the study. It is useful for the student to see if they like it. I do this because it is a perennial question. I do this because there is a prevalent thesis that one must always breathe in and out in conjunction with each and every movement while doing Tai Chi . I find that students reach conclusions from viewing the videos that we were breathing incorrectly. 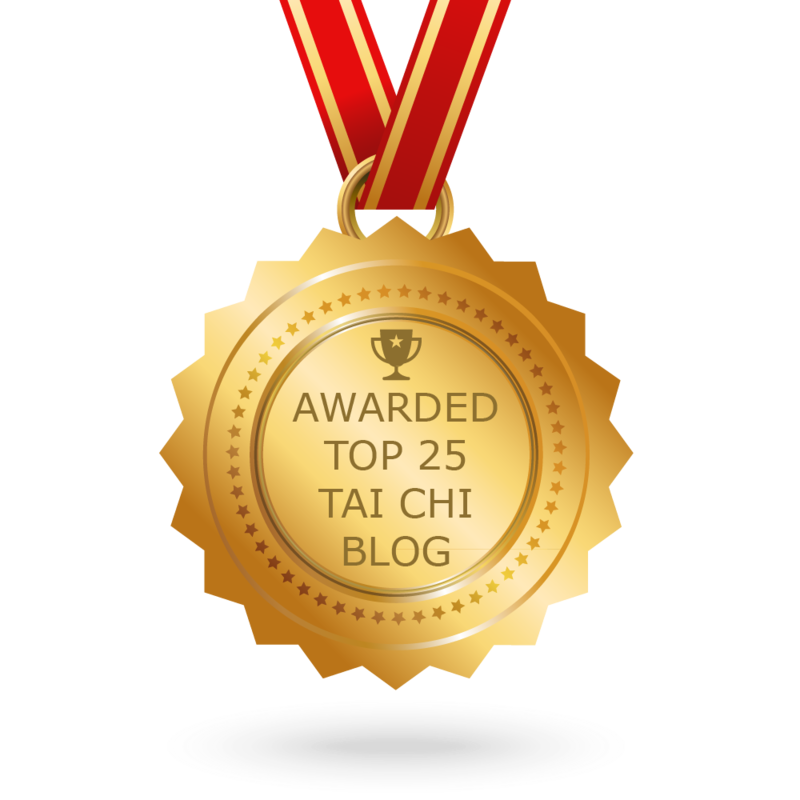 I also list numerous book references below where there is a lot of emphasis on insinuating some form of breathing qigong into the learning of Tai Chi. Fu Zhong Wen is obvious on what his position on breathing is. In light of these types of arguments and their prevalence, it is my feeling that the debate about breathing will rage on forever. It will go on in both a “my style vs. your style” format and in an "I'm right and you are wrong" format as well. We can begin the discussion in Uncovering the Treasure, Stephen Hwa, p. 98: “One should not try to incorporate breathing qigong into Tai Chi…after all Classical Tai Chi itself is a much better motion induced qigong than breathing qigong”. You can readily see the complexity and various planes on which the motion occurs. How one could view this and then develop a thesis about incorrect breathing is perplexing. I put it to the reader: Ask yourself at what point would one decide where they should breathe in or out? How would insinuating some form of breathing qigong not interrupt the internal energy? There is also the concern that all beginners should drop their previous learning (not an empty request). Unless the study is going to be limited in its curriculum there is going to be a lot on their mind right from the very start. Why then would one want to add concern with how to breathe to an already busy mind? In the Compact form above, Master Hwa is probably going at an “10 minute to do 108” pace which is somewhat rapid. It is particularly rapid compared to practitioners who take say “40 minutes to do 108” and also state that they insinuate various breathing qigongs into their form. In order for me to insert the breathing that students suggest to me, one would undoubtedly hyperventilate. I speak of course of attempting to insert qigong breathing techniques into even the 10 minute round form that Master Hwa is doing. One can only painfully visualize how one might blackout at that pace with those artificlal breathing standards. One can only imagine what might happen at a 4 minute or 3 minute pace that the “tight” Compact Form calls for and using such breathing demands. By the way what is the point in trying to improve your breathing by forcibly taking a longer inhale and exhale in Tai Chi as some teachers recommend? If you want to breathe deeper, refrain from slouching and simply straighten the torso by allowing your head to stretch up at the neck…you will breathe deeper once you do that. Besides, it is the classical way to learn Tai Chi, one stretches the head up as though it was suspended from above, chin tucked in as well. In forcibly trying to extend the breath or insinuating the breathing qigong into Tai Chi, the flow of internal energy will undoubtedly be disturbed. Why would one want to do this when by breathing naturally in Tai Chi there is so much to enjoy with the flow of qi in an otherwise relaxed body?